2 Adjustable basket makes it convenient to cut straw to various size as per as requirements. Description : Straw Reaper is a threshing machine which can cut, thresh and clean the straw in a single operation. It is low on fuel consumption and high on performance. It comes with Heavy Duty Gear box, transmission shaft and Axles. A world class threshing system, double blower and a 7.5 feet cutter bar with special blades makes it a very effective machine. We are the leading manufacturer of all types of STRAW REAPER, which are manufactured from high grade quality raw materials. 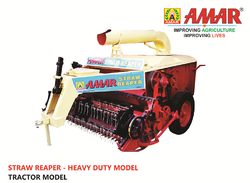 These STRAW REAPER can be customized as per our precious customers specifications. These STRAW REAPER are widely known for its durability and quality. Our STRAW REAPER can be availed at industrial leading price. Drum Size: 56" - 61"
HIND AGRO Industries (Regd.) is a Govt. recognized manufacturer of world class Combine Harvesters and Agricultural Equipments. HIND AGRO Industries (Regd.) 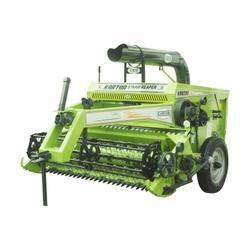 is known for inventing and producing high quality agricultural equipments according to the norms set by Government Of India, Ministry of Agriculture (Department of Agriculture and Co-Operation). Kartar Straw Reaper offered provides functioning as a threshing machine where it runs the function of cutting, threshing as well as cleaning the straw in one operation. Here, the wheat stalks which are left after combine harvest are cut using oscillating blades while the revolving reel helps in pushing them back toward auger. NEW HIIND 99 Straw Reaper is an agriculture threshing machine, that cuts, threshes & cleanes the straw in one operation. The wheat stalks left after combine harvest are cut by an oscillating blades while revolving reel pushes them back toward & auger. Our harvester reapers are as per following specification.